Upon birth, babies begin a developmental journey that will transform them from immobile infants to bipedal toddlers within 12-15 months. This crucial window is their opportunity to move in innate, prescribed ways in a sequence optimized for building neuromotor coordination. With this highly-evolved pattern, infants gain sustainable strength, coordination, and mobility that lays the foundation for their biomechanical future. Whether it’s turning in the direction of a sound, reaching for an object, or talking a first step − these soft-wired neurosensorimotor sequences require no technological intervention − only free-range interaction with a flat surface in a safe environment. *For copies of this poster, please reach out. Nevertheless, manufacturers of infant orthotic devices (IODs) − like Bumbo Seats, exersaucers, jumpers, and walkers − have made widely-accepted claims that such devices benefit infants by “helping” them learn to sit, crawl, and walk. Meanwhile, research has shown that these IODs alter how infants’ soft-wired motor pattern development is executed. In fact, the artificial support to infants’ limbs and spine has been shown to delay, alter, and potentially cause long-term motor pattern dysfunction. Above on the left, this child is experiencing a compensated spine because this pillow offers artificial stability to the developing infant, shaping the lounged child’s spine into a convex “C”. The head and neck are forced into flexion, altering sensory input required for instinctual motor pattern development. Above on the right, this child’s spine is in a long, neutral, and elongated position. There is no need for the child to be supported here. The child has an age-appropriate viewpoint of its surroundings and has the ability to interact with its environment. In another example on the left, this fixed seat creates artificial support and restricts normal, age-appropriate movement. The infant compensates with a kyphotic spine and overdevelopment of neck musculature. A child who can not sit without assistance should not be placed in a seated position. On the right, this child is in an unsupported, free-range, age-appropriate position and is stabilizing its spine and head. Not yet ready to sit up on his own, this child can still interact with his environment in this position and does not need to be supported in an IOD. On the left, this child is not yet ready to stand; when placed in a vertical position at this stage, the child reacts to the abnormal stress on ankles, knees, hips, back and neck with compensatory, less stable patterns of movement. On the right, this child has attained the ability to stand on her own: This child has appropriate positioning and motor control of feet, knees, hips, spine, neck and skull. This child did not need an IOD to help her learn to crawl, sit, stand, or walk. 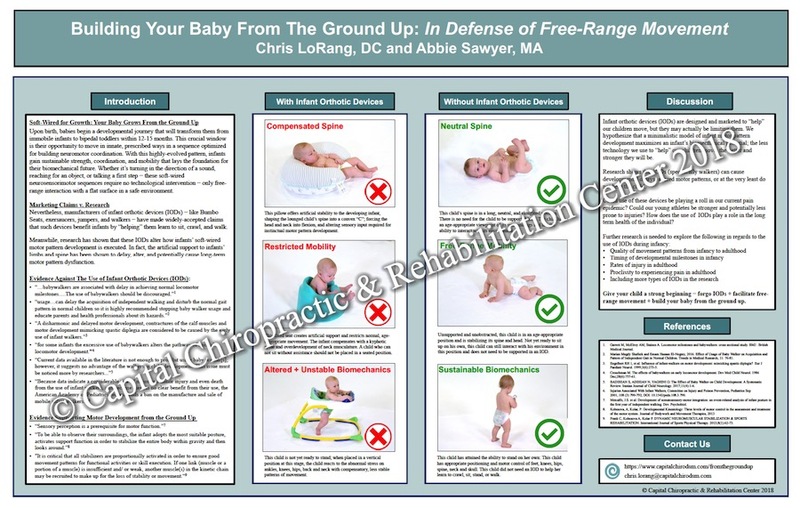 Give your child a strong beginning − forgo IODs + facilitate free-range movement + build your baby from the ground up. Garrett M, McElroy AM, Staines A. Locomotor milestones and babywalkers: cross sectional study. BMJ : British Medical Journal. Marian Magdy Shafeek and Emam Hassan El-Negmy, 2016. Effect of Usage of Baby Walker on Acquisition and Pattern of Independent Gait in Normal Children. Trends in Medical Research, 11: 76-81. Engelbert RH 1, et al. Influence of infant-walkers on motor development: mimicking spastic diplegia? Eur J Paediatr Neurol. 1999;3(6):273-5. Crouchman M. The effects of babywalkers on early locomotor development. Dev Med Child Neurol. 1986 Dec;28(6):757-61. BADIHIAN S, ADIHIAN N, YAGHINI O. The Effect of Baby Walker on Child Development: A Systematic Review. Iranian Journal of Child Neurology. 2017;11(4):1-6. Injuries Associated With Infant Walkers, Committee on Injury and Poison Prevention, Pediatrics Sep 2001, 108 (3) 790-792; DOI: 10.1542/peds.108.3.790. Metcalfe, J.S. et al. Development of somatosensory-motor integration: an event-related analysis of infant posture in the first year of independent walking. Dev. Psychobiol.